This was my closet before last week. I had an organizer (Erin Bonner of Erin Does) come and help me finish getting things into place. I was feeling like I would never get it done, and contacted Jenn at Find Your Floor but wanted someone sooner. She referred me to Erin and we are on a roll. The whole thing was overwhelming me and I thought this would be worthwhile. I am so pleased with the progress!! If your looking for someone in the Boston area (Cambridge/Somerville/Medford/etc) these women are great. This was a part of my 2017Q4FAL, which you can see here. First up is my nicely organized bookshelf. Mostly quilting books on the bottom 2 shelves, some memorabilia on the next two, and the top has miscellaneous folders, and a few Christmas things that never made it into the Christmas box last year. On the bottom left corner you can see the door into the closet, and my knitting basket with current projects. Next up you will see a few pictures of the closet. All of the interior closet pictures are a little distorted, as they were shot in pano mode. First up in the closet is the top shelf. Hoops for hand quilting, my Bernina travel bag with bed risers ready for a retreat, some miscellaneous fabric, some completed quilts/pillows, waiting for a home, and my mac box. This next shelf has strips in the black boxes, ribbons and wrapping paper in the next box, some more memorabilia, which is next up for sorting, and some knitting and other projects on the far right. 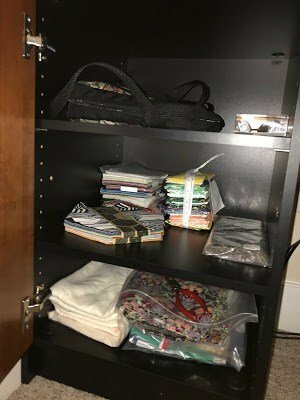 This grouping below has knitting needles, sewing tools in the black drawers, projects in the the next two plastic bins and a nearly finished project in the pink bag, and then some quilting stencils and bags in the corner (oh and a yarn swift, too). This last part of the closet is FUN! 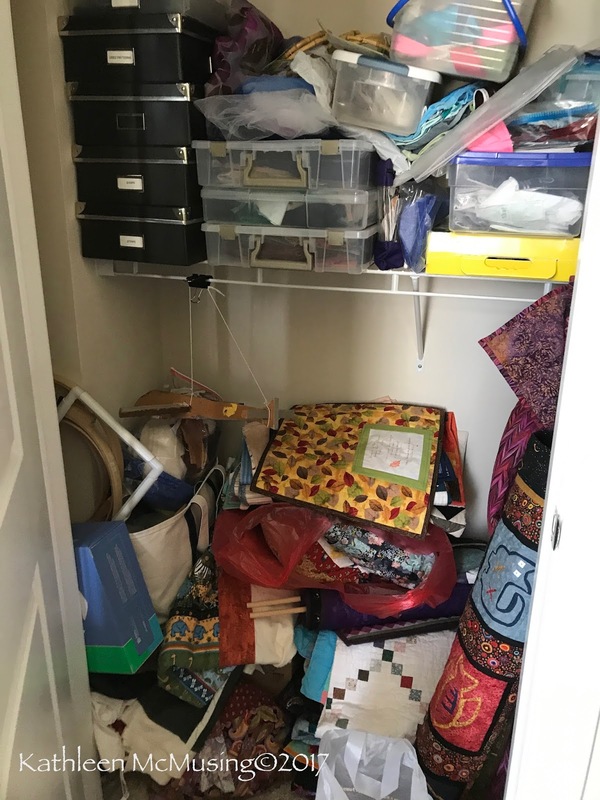 it is a narrow section, but holds a lot of things: on the the bottom is a set of draweres with more tools, some teaching projects and then some scraps! Just so you don’t think there isn’t any fabric, here are a few shots of the cabinets and their contents in my study. 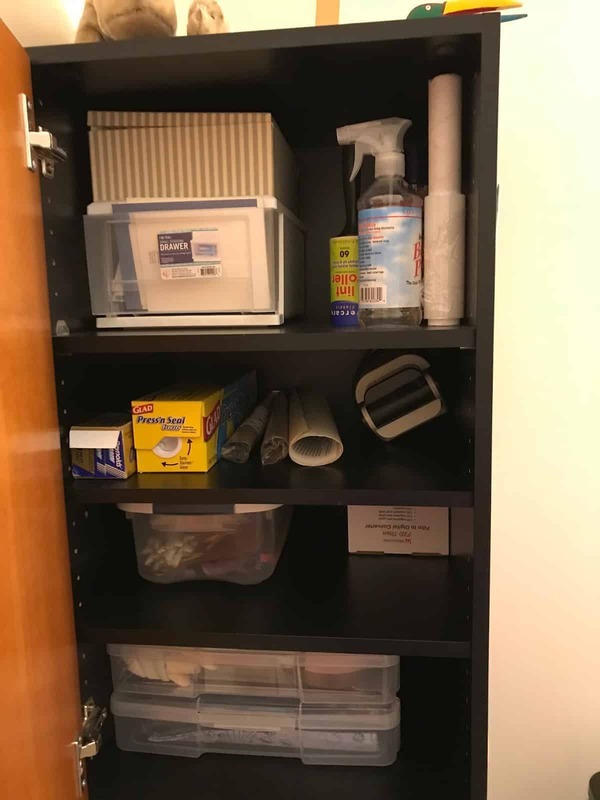 One cabinet has fabric and a file drawer with patterns, rulers, etc. The file drawer is still a work in progress. 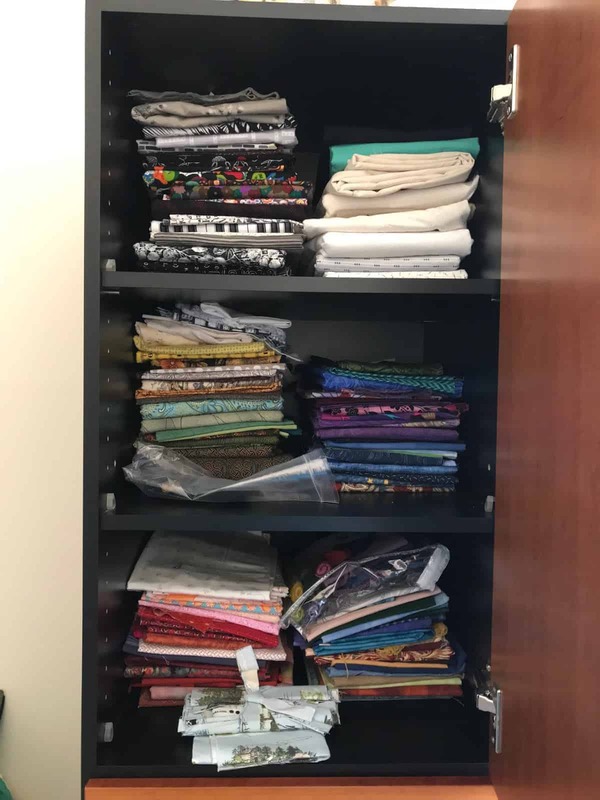 These next two are cabinets nearer my desk and have a variety of things in them: notecards, ironing essentials, project boxes, then some bags of projects, precuts and finally some batting and fabric collections waiting for a project. While a couple of these things keep getting moved around I feel like I am really nearly there!! Hallelujah. 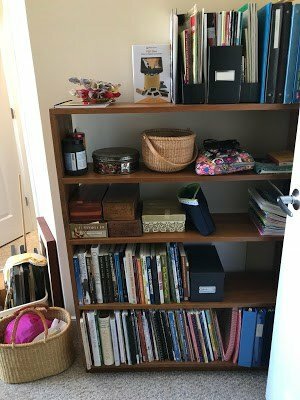 I will show you the desk and sewing area, once the walls are a little more dressed, but I am thrilled that I can now work and find things so easily and there really is a place for everything. Another bonus – many projects are identified and the list keeps getting smaller…nothing new until I get through a few of the longstanding ufos! Congratulations on your almost finished sewing room redo. It's amazing how much a closet can hold. You didn't mention if your coach wanted you to donate some stuff. I have a hard time parting with stash from years gone by. BTW, you don't look like you have enough fabric and you are next on my "hit" list. Hee, Hee. Thanks, Rose. I was sewing yesterday and straightened up as I finished. It is so much fun. Before we moved, I did thin out some things, I bet half my fabric. 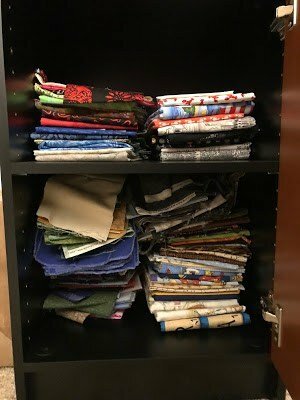 There were groups bringing fabric/art supplies to Syria and Guatamela – I hope they are enjoying them. I am fairly selective in buying fabric, and pretty controlled considering I was working in a fabric store for 17 years! I saw Wendy received a little package from you – what fun! Congratulations! I'm glad you found great help. It looks wonderful and I always feel so much more inspired to create when things are organized. Thank you, Yvonne. It really was a pleasure to sew and even straighten up until I return on Wednesday. Looking forward to this new phase where my study isn’t the last place to get any attention. Still want to hang a few quilts…and figure out a design wall. Leaning towards Cheryl’s Design Wall as I don’t need it all the time. Oh I'm so glad you're getting organized! I know you've been wanting to get that done! I finally had to stop creating yesterday and do a little organizing. My space was starting to overflow a bit. Have fun creating now that the organizing is underway! I feel like the weight of many years of cluttering my old space is gone. I did some work yesterday and then was even inspired to straighten it up, since we are off to Maine for a few days. Just ❤️ the way it feels now. Nice! I would love a studio fairy to wave a magic wand. Yours is looking so organized and useable. What's in the knitting basket? Nancy, the fairy was a great investment. I still made the decisions but she really helped and she took away the donations. I did a fair amount of downsizing my stash before the move, but there was still (and still is) room for more. The knitting holds a shawl, a scarf and a hat. Projects that have been with me a while but have a commitment to be finished by the end of January! Actually it only took one woman and it was the best thing I ever did for me. It was so much easier than doing it on my own! Highly recommend it as part of the “cost” of moving or renovating. Oh, your space looks amazing! Getting organized is always my first step in restarting creativity.